Warhammer: End Times—Vermintide, despite my low expectations, is by all reports a pretty decent game. 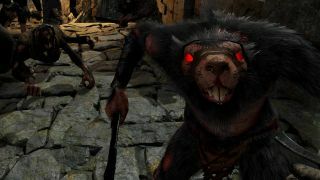 And now that it's out, developer Fatshark Games says it has big plans for the future, including both free and paid DLC. One thing that's not on the menu, however, is microtransactions. "There will be lots of stuff added post launch for years to come. We have a real solid game on our hands, in a game world with endless possibilities," the studio wrote in the Steam forums. In a follow-up message, it added, "We will alternate between free dlc's with paid dlc's. And make sure they are constructed so neither split the player-base." Fathshark also very succinctly dismissed concerns about the possibility of microtransactions being added in the future. In response to a follower who said he hoped fans "don't see any microtransactions" in the the game, the studio tweeted simply, "You won't." It might seem like a far-fetched concern, given that as far as I know there's been no suggestion that microtransactions will, or even could be, brought into play. On the other hand, they were incorporated into Payday 2 more than two years after that game came out, so it's not entirely beyond the realm of possibility—although it bears remembering that Payday developer Overkill made the same "no microtransactions" promise, too. That doesn't mean that Fatshark's words are empty, but stuff, as the saying goes, happens. We're working on a review of Warhammer: End Times—Vermintide at this very moment, and will have it up for you as soon as we can.